Place the hands beside the ears and apply some pressure so that the head and chest raise easily. Stop and come down if raising causes strain or if entering requires forceful fast movements. Wait until you gain more shoulder flexibility. For good alignment you may want to place the force in the top of the head. Create space around the neck for the elements to flow. Sometimes you may want to tilt the head back more and allow the neck, in the front, to stretch. This will compress the back of the neck. Make sure you are both strong and flexible before moving the head position into more strenuous positions. This yoga posture is actually a lot easier than it looks. There is some potential for neck injury or aggravation so make sure the shoulders are flexible enough for the arms to aid in the support of the upper body. 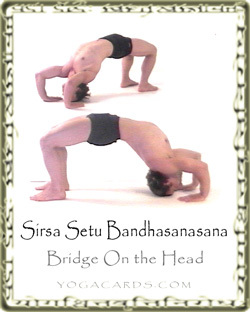 When the neck is very strong this yoga posture may be performed without support. Push on the first fingers and thumbs. This will align the elbows correctly and allow more energy to travel from the earth up through the inner arms. Weight will also be more evenly distributed over the hands. This pose is highly effective for toning all parts of the body. The legs, back, deep spine and arms are all toned from performing this posture. It is also a good pose to develop strength for the Headstand (Sirsasana ) and does not compress the neck as much as the Fish (Matsyasana ). Deep muscles in the spine are strengthened such as the iliocostal lumborum, longissimus thoracis, iliocostalis thoracisis. longissimus cervicis, longissimus capitis and the iliocostalis cervicis, spinalis thoracis. In the neck the Spinalis capitis and semispinalis capitis are strengthened. Many people will be afraid to perform this posture when they are actually quite capable. Help people into this posture and hold them the entire time by taking the strain away from their upper bodies weight on the neck. Observe the students ability to remain in the pose and use the arms for support the help them down slowly reminding them never to enter or exit this yoga position too fast.